This is how many kw's 9.199 to be exact that this 11kw array was producing on the 8th May 2 days after completion. James Ward one of the owners said how pleased he was and this was an excellent contribution to his many efforts to save energy for their company. JJ Ward & Sons are serious about significantly reducing their energy overheads, radically reducing their carbon footprint and meeting their green agenda targets. 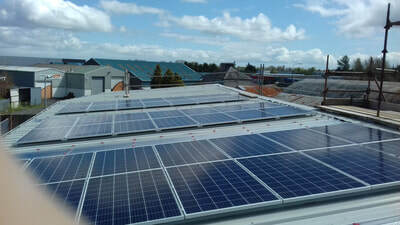 With the help of PV Energy Ireland (yes that’s us) they have installed a rooftop solar system to generate their own clean green energy and help keep prices down.